" ... Blessed Anthony was a great lover of prayer. He would not start any activity unless he had meditated over it together with Jesus, and asked for his enlightenment. Any available time he would spend at the feet of Jesus present in the Eucharist, from whom he would draw help and strength for his own sanctification and the one of others. 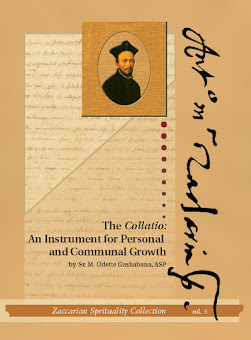 Since his living, thinking and acting were' totally directed toward God, with great ease he was able to recollect himself into prayer, so that in any place and after any activity right away he was able to concentrate his soul on God. Prayer was his principal refuge for all his needs, and his relief and comfort in his work. Since during the day, being so busy on behalf of souls, he had very little time to spend with his God he made up for this during the night, sometimes spending part or all of it in prayer. Then he would recommend to God not only his own needs, but also the ones of his neighbor and of the whole Church. And he used to do this with such a zeal and trust in the divine bounty, that his prayers couldn't not be granted by God. This is confirmed by what was said by the Angelic Antonia Sfondrati, 'Fr. Anthony was a man of such great prayer that each of his spiritual children gave witness of the help received through it.' But what made sweet so many hours of prayer was meditation and contemplation of heavenly subjects. Sometime he was so absorbed in it that he seemed to be out of his senses. The fruit Anthony Mary wanted and actually derived from his prayers, was the supreme science of Jesus Christ and a deep love for Him" (op. cit., 2, 69-70). Anthony Mary draws inspiration directly from Christ, "He," he writes to the laity in Cremona, "suffered ... hunger and thirst, passed many long nights in prayer" (Sermon IV) This is the source of his invitation always to the laity gathered in the little church of St. Vitale, in Cremona: "macerate your body with hunger. 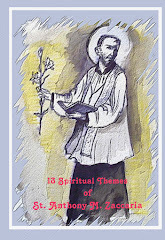 .. , stay awake in prayer" (Sermon I) Above all, this was the example of Paul to whom Zaccaria was often referring to. It would be enough to remember what he said to the very first Barnabite confreres in a tempestuous moment of their history, exhorting them to imitate the Apostle in "sleepless nights and fasting" (Sermon VII; cf. 2 Cor 6:5). Therefore, we are not surprised when he recommends to Charles Magni, a Cremonese law­yer immersed in his business, to pray "at all time, that is, night and day" (Letter III), and that he takes for granted that the spouses Omodei would be dedicated "to pray for one or two hours" (Letter XI), trying to "often elevate your mind to God" (Letter III) and "to Christ" (Letter XI) throughout the day. This is also what he prescribes with great determination for the religious, "we want to establish that at least for two hours between day and night, we dedicate ourselves to Prayer, without being involved in any other work. We beg you also…, raise your hearts to God" (Constitutions X). Vigils and fastings are only means. 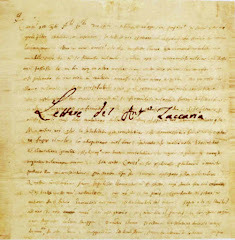 Even if "an order has been given and accepted to increase fasts and vigils" to better keep the precepts of God and of the Church, still these "are not appropriate and necessary instruments for that end," Zaccaria observes in the Constitutions, "Instead con­sider as necessary means for that end, the voluntary humiliation of oneself, the resolution to want to endure sufferings and pains similar to the ones of Christ and of the Saints, to put aside their own feelings and their own opinions" (Constitutions XIX). Let us give thanks to our Saint for a vision of spiritual life which is committed and balanced, and…let us imitate him.